See http://www.igenex.com/lymeset7.htm for more info. Photo: Victoria Arocho/Associated Press A female deer tick under a microscope in the entomology lab at the University of Rhode Island. Is the tick problem getting worse, or does it just seem that way at this time every year? Fighting back involves a lot of individual strategies: tucking pant legs in socks, using bug spray (while hating it), obsessively doing full-body checks at the end of a summer day and building deer fences. Yet the public as a whole has been ineffective in dealing with the plague of black-legged (deer) ticks, which spread Lyme disease, a problem linked to, among other things, the overpopulation of deer, which the ticks feed on. What is important to know about ticks and their environment, and what steps might be taken to control them? Thomas Mather is a professor of public health entomology at the University of Rhode Island. He directs the TickEncounter Resource Center, a leading source on tick-bite protection and disease prevention. Ticks definitely are a bigger problem than 25 years ago. In the northeastern U.S., black-legged (deer) ticks have spread well beyond former coastal haunts; in the southeast, Lone Star ticks are seemingly everywhere. The only good news is that dog ticks are far less common in domestic environments, probably due to wider-spread use of pet spot-on products. Deer are the most important reproductive hosts for deer ticks. The observed tick increase relates directly to deer populations, which are exploding in suburban and even semi-urban areas. 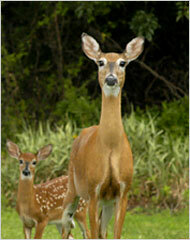 Deer are the most important reproductive hosts for deer and Lone Star ticks. In Rhode Island, each deer produces about 450,000 larval deer ticks every year. Add a few deer and it’s no wonder that tick populations skyrocket. While the level of deer reduction needed is logistically and politically challenging, one potential solution we are working on is an anti-tick vaccine ”” to make humans or deer inhospitable tick hosts. Deirdre Brennan for The New York Times Deer on Shelter Island. 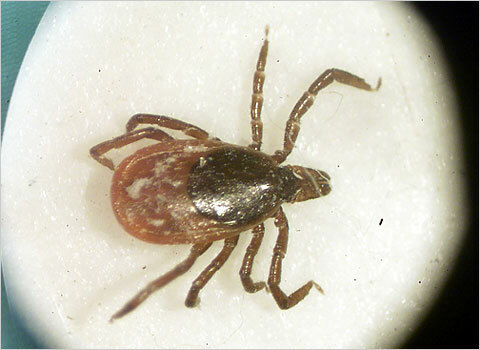 As disease-carrying ticks become more common in the domestic environment, tick bite protection and disease prevention becomes a critical everyday need (at least during spring and summer). Effective everyday tick-bite protection strategies do exist but few people use them regularly. Until effective broad-spectrum vaccines are found, social marketing may prove most effective at encouraging anti-tick actions. For example, changing the way people dress in summer ”” wearing clothing with permethrin tick repellent built in ”” can make protection easy, but this strategy is still not mainstream. Maybe just a few of the thousands of celebrities living within 25 miles of the Route 95 corridor from Washington to Maine could step forward and help out. Felicia Keesing is an associate professor of biology at Bard College. Imagine if there were an animal roaming our forests that attracted ticks by the thousands. 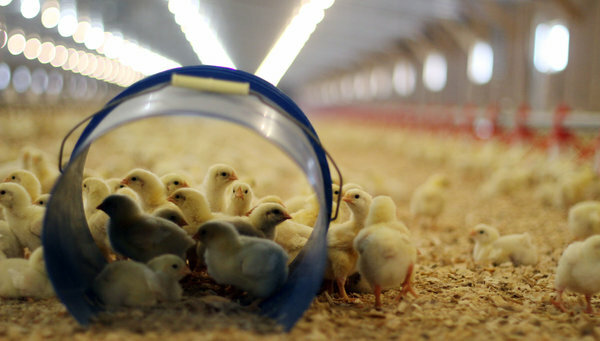 But imagine, too, that instead of giving them a tasty blood meal, it groomed virtually all of them off and killed them before they even had a chance to feed. Such an animal would be, in essence, an ecological trap for ticks ”” and a boon for human health. Animals that groom themselves are good at killing ticks. Unfortunately, they do not include mice. Such an animal exists, and it’s called the Virginia opossum. These medium-sized mammals are widespread throughout much of the eastern United States and they and several other species now appear to play a prominent role in reducing human risk of exposure to tick-borne diseases. The animals that are best at killing ticks through grooming are big, at least compared with mice and chipmunks; the causes for this relationship are not well understood. But big species have another important feature as well. Larger animals tend to be the species that disappear when forests are fragmented. So when we fragment and disturb forest ecosystems, we run the risk of losing ecological traps that would otherwise be protecting our health. Richard S. Ostfeld is a senior scientist at the Cary Institute of Ecosystem Studies. He is writing a book on Lyme disease ecology to be published next year. Sometimes scientists think they have discovered something new only to find out that it was really not new at all. Such is the case with the tick responsible for Lyme disease. In the 1980s it was incorrectly named the “deer tick” but it is now known to be the black-legged tick, a species that has been known for many decades. This tick species bites dozens of species of mammals, birds and reptiles ”” not just deer. And several recent studies in New York and New Jersey have found no connection between populations of deer and ticks. In fact, abundance of black-legged ticks is more closely tied to that of white-footed mice. Ticks feeding on mice survive well and are highly likely to become infected with the Lyme disease bacterium. Abundant, nutritious acorns cause mice outbreaks the next summer and tick outbreaks two summers later. So, what causes mouse populations to grow? Recent studies point to two strong forces. One is heavy acorn production by oak trees. Abundant, nutritious acorns cause outbreaks of mice the next summer and outbreaks of ticks two summers later. The second is the loss of predator diversity. As forests are chopped up into small fragments, foxes, coyotes, weasels, owls, hawks decline or disappear. Although acorn production is hard to control, we do have the power to prevent biodiversity loss by protecting extensive tracts of forest. Protecting biodiversity protects our health. 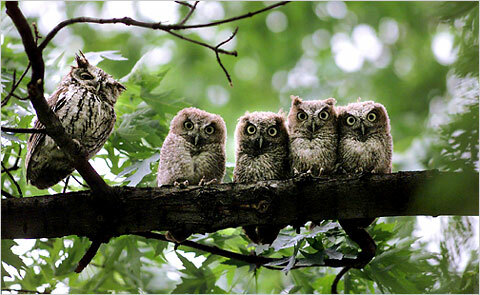 Doral Chenoweth III/Associated Press via Columbus Dispatch Tick control: An eastern screech owl and its four babies. William L. Krinsky is an entomologist at the Peabody Museum of Natural History at Yale. Wherever small and intermediate-sized rodents like white-footed mice and gray squirrels thrive, ixodid ticks seem to be abundant. But it has also been apparent for many years that deer, as large sources of blood, are important for all stages of the tick, and white-tailed deer are an essential part of the equation for the population of black-legged ticks, Ixodes scapularis, to reach levels enabling the continuation of the epizootic and human cycling of the Lyme disease spirochete. The reforestation of the northeastern U.S. over the last century has been accompanied by a huge increase in the deer population and the consequent huge population of the black-legged tick. The dearth of knowledge concerning the locations of the spirochete bacterium in human organs, the degree to which it persists and where it persists, if it does, has prevented the kind of clear understanding that could reconcile the various ideas about adequate treatments, the reality of chronic Lyme disease and the most useful means of testing for the organism. Spirochetes by nature are insidious organisms, and the complexity of their relationship with different mammals and birds only complicates an understanding of their biology. Add to that, different person’s immunological responses to spirochetes, and the confusion increases. Prevention of tick exposure continues to rely on separating oneself with physical and chemical barriers from the organisms by covering exposed surfaces of the body and using tick repellents (most effectively, DEET). Such recommendations have not changed in more than 50 years. Daniel E. Sonenshine, professor emeritus in biological sciences at Old Dominion University, is the director of the university’s Animal Care Facility. A common complaint that scientists working on tick ecology often hear from the general public is that ticks are unbelievably numerous in the late spring and summer of that particular year. Unfortunately for the scientists, few measurements are available that they can offer to explain how tick populations expand and contract with the seasons. We need a formula to look at tick populations over a broad region and integrate them with the disease risk. In contrast to mosquito control procedures where traps are set out to measure insect numbers and identify localities needing treatment, no comparable procedures are used by city or county governments to monitor tick populations. We do have detailed studies that have measured tick abundance over the years, but they are highly localized. Deer ticks are most likely to be abundant in and adjacent to wooded areas near the Atlantic Ocean as well as near rivers and river estuaries, brooks, streams and lakes where white-tailed deer are numerous and small mammals exist. In most years, periods of cool, wet weather during the spring followed by long sunny days in early summer are likely to sustain high populations of nymphal deer ticks. However, other factors, such as good production of acorns, nuts and seeds that small mammals like white-footed mice eat are also of great importance to insure a high populations of hosts for the juvenile ticks. The most significant development that may lead to a better understanding of tick population biology and how to control these dangerous vectors of the Lyme disease bacteria is the creation of mathematical models. My group at Old Dominion University is in the process of creating one such model that will integrate the tick populations over a broad region with the disease risk for the disease-causing agents that they carry and transmit to people.